The Basque country is located in the southwest of France. Half is in France and the other half in Spain. It is famous for its character and its culture. A countryside that will leave you breathless as the Pyrenees mountains plunge into the Atlantic ocean. Many athletic activities : surfing, pelote, rugby, hiking and golf. Culinary specialties : ham, Basque cake, sheep cheese, tapas, veal based axoa. Great traditional events : town reunions, dances (mutxikoak)… very friendly and welcoming. 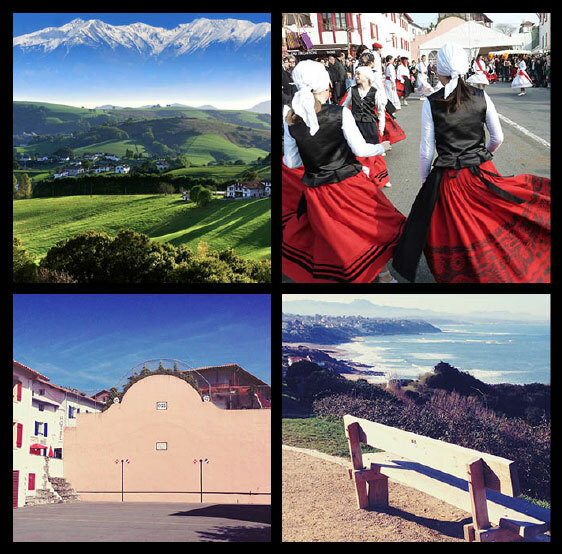 We don’t know where the Basques come from but we know they were great travelers since we find their culture all over the world. The Basque language and its culture continue to expand all around the world thanks to a great community network. The Basque cross or lauburu (lau (four) buru (head)) is present everywhere and a true representation of our identity. 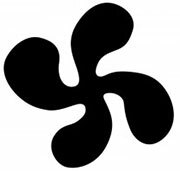 Its origin is still mysterious but its circular movement and its four heads would represent the life cycle or the cycle of the sun and the four seasons. The Basque flag or « ikurrina » is a more recent symbol of the Basque country. Created in 1894, it is today the official flag of the Basque country autonomous community in Spain, and represents the whole Basque territory even though it is not recognized in France. The red background is the color of the Biscaye province, where it is born. The green cross stands for the oaktree of Guernica, symbolic place where priests get blessed. The white cross overwhelming the other two represents the catholic faith. We are a French family based in Bidart (French village in the Basque region) where we own a bakery with 20 employees. French people buy their fresh bread and pastries everyday and therefore, we have a privileged relationship with all our customers that give us feedback on the quality of our products. We base our business decisions, economical and strategic, on family values of sharing and enjoyment. Passionate about our work, culture and new projects, we are open to discover new horizons and share ideas and opportunities. Amerikanuak is the name for the French and Spanish Basque immigrants who came to the New World to make a better future. 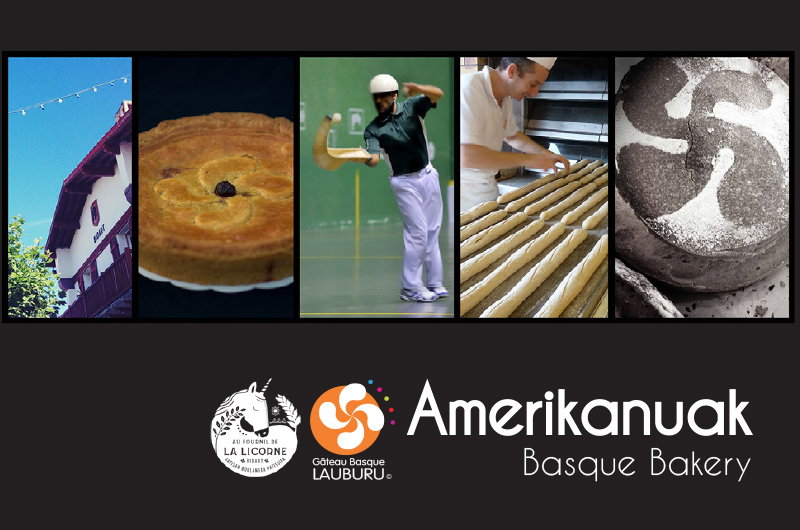 This piece of history is dear to our heart and we decided to translate it into recipes in order to share the flavors of the Basque culture crossing the Atlantic Ocean to meet the Americans and build a common future. There are as many cakes as Basque grandmas proud to declare that they are the only ones to know the real and unique recipe. 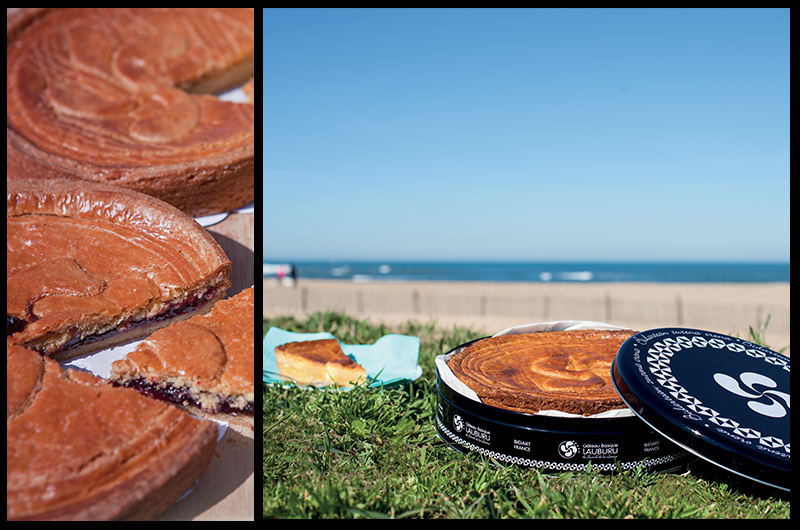 We made our own Basque cake respecting traditional ingredients and texture, with a touch of freedom to pay tribute to ancestors. Talo is the Basque fajita, a sort of cornmeal pancake we can fill with bacon , Basque goat cheese, eggs… This is the traditional dish in every village festival in the Basque country. Bread is the most important part of the French meal as the typical picture representing a Frenchman is one of an old man on his bicycle, holding a baguette bread under his arm, with a Basque beret on his head. 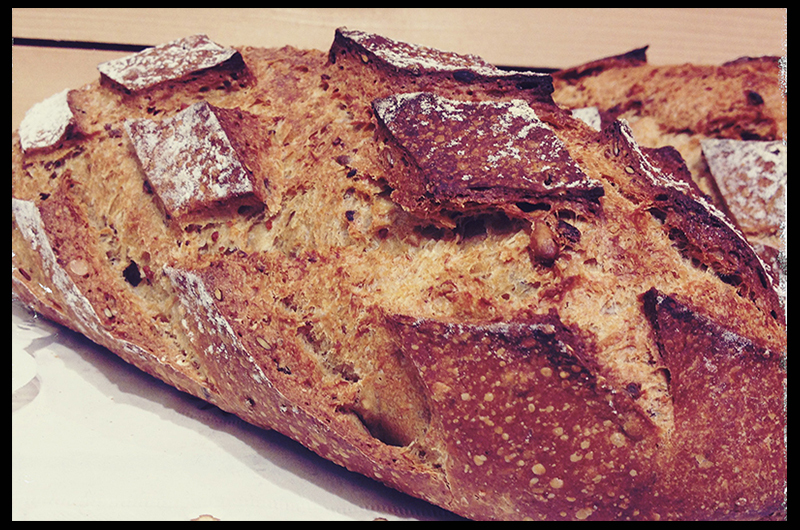 Each baker has his own recipe for bread and ours is based on traditional recipes from the Basque country. We take pride in handmaking our dough with quality products in order to sell a product that has its own identity at the right price. All our ingredients are from organic farming. Amerikanuak were mostly sheepherders and there is a long tradition of farming , respect for the animals and pride of our countryside in the Basque region. A manner for us to honor this history is to produce the best products we can, with a good taste and very healthy. We have made the choice to control all stages of production and develop close partnerships with our suppliers in order to offer the best sustainable quality. We want to perpetuate traditional recipes, flavors, know how, in accordance with current requirements. Respect and sharing are at the heart of all our choices. We want to base our relations on strong family values, loyalty and solidarity, with our employes, our clients, our suppliers, and all the partners with whom we tie long lasting relationships. We also want our working place to be welcoming and fun where clients and employes enjoy sharing, working, and socializing. These values are the true identity of the Basque community.